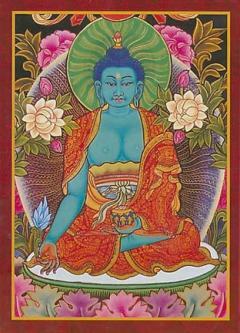 White Tara Tibetan Buddhist Greeting Cards : These colorful greeting cards feature images from Tibetan Buddhism, in particular the major deities found in Mahayana Buddhism in Tibet and Nepal. Each card explains the meaning of the deity depicted on the card, but the inside is blank so you can compose the perfect note to a loved one or friend. 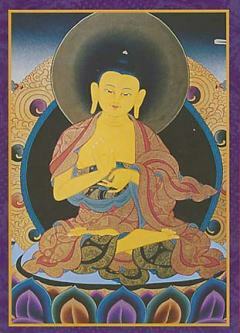 White Tara is the essence of feminine wisdom, compassion, healing and abundance. 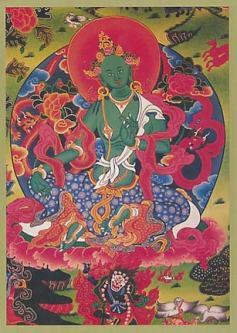 White Tara offers guidance and protection to all on their journey across the ocean of Samsara (the illusionary world created by the ego). She is believed to protect her followers as well as fill their hearts with love and compassion. She is also invoked by beliefers for the blessing of a long life. In one hand she holds the blue lotus while the other makes the gesture of bestowing a gift on mankind. 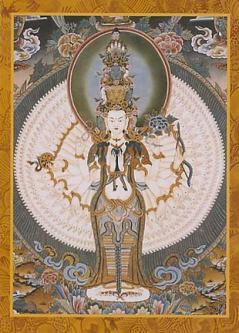 White Tara is believe to have seven eyes, the extra being in the forhead, the hands and the forhead.